Contest: Enter to Win the iBunny from Van Otis Chocolates! 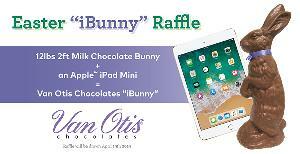 Enter to Win the iBunny from Van Otis Chocolates! Prize: Win a massive 2-foot-tall, 12-pound chocolate bunny... AND an Apple iPad Mini! PRIZE MUST BE PICKED UP AT THE NEW HAMPSHIRE STORE BY THE WINNER. What you must do to enter: fill in form. PRIZE MUST BE PICKED UP AT THE NEW HAMPSHIRE, USA STORE BY THE WINNER. Statistics: This contest was opened by 107 and entered by 5 ContestChest.com members. 5% of those who opened the contest, entered it.